The circular design surrounds the circular Egalitarian Hebrew and English texts which are written in purple to complement the purple in the grapes. The Sunflowers, which are the Bride's favourite flowers, were added to the illumination. 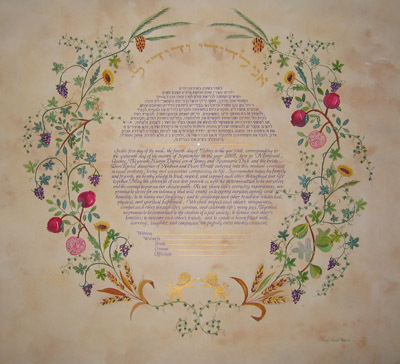 Above the Ketubah text in gold paint is the verse from "Song of Songs": "Ani LeDodoi VeDodi Li". Each letter is individually embossed. Below the text are two "Lions of Judea" in Shell Gold.The Seven Species in the design surrounding the text are: Wheat, Barley, Grapes, Pomegranates, Figs, Olives, and Dates. They are intertwined with a delicate vine and with 23K Gold Leaf dots in between the vines.